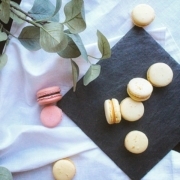 Macaron is one of the most French sweets. When I find it in town, it reminds me of my beautiful life in France. The dough is made from almond powder, sugar and egg white. Yes, it’s very simple, isn’t it? But it’s pretty difficult to make the perfect macaron at the beginning. You need to know the perfect consistency and conditions. There are two types of recipes, one is made of French meringue, the other one is Italian meringue. Actually I prefer the French one, because it’s less sweet and has a lighter texture. But the Italian one is easier to handle, it tends to turn out successful even for beginner. So I’ll show you the Italian one today. You might fail a couple times (or more) at the beginning, but there is nothing better to impress your guests, so keep trying! Sift almond powder and powdered sugar together. Add 15g of egg whites, mix to combine. Put granulated sugar and water in a small pot, start heating. Meanwhile, set 30g of egg whites in a mixing bowl, start whisking. When the syrup reaches 117-120℃/242-248℉, add the syrup little by little into the soft peak stage egg white. Keep whipping until it gets to room temperature. Add the meringue into the dough in three parts, Continue to fold until the batter falls into ribbons and the crest doesn't fall away. Transfer the batter into a piping bag with a round tip, Pipe onto a parchment paper. Leave the macarons to dry for about 15 min until dry to touch. Bake at 170℃/340℉ for 10-15 min until the macarons don't stick to the parchment paper. 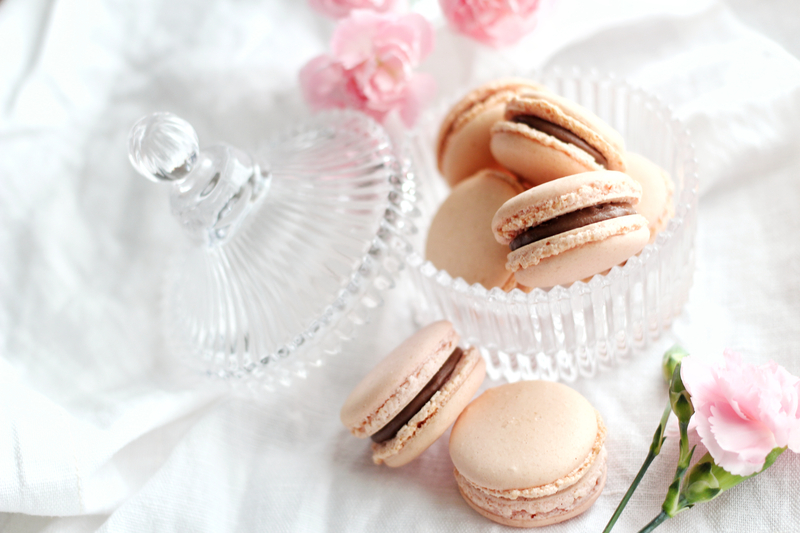 Take two macarons, fill with your favorite cream, chocolate, or jam to make a little sandwich, and enjoy! The time for drying will be different depending on the weather. When it’s a hot day, turn on AC while leaving the macarons to dry. « Which size of eggs should we use?